Boundary-scan has proven itself time and again to be a truly versatile interface for structural test, embedded functional test, built-in self test (BIST), software debug, and in-system programming. Supporting such diverse applications requires a controller with high performance specifications and diverse features. The NetUSB-1149.1/E is a high performance, multi-feature boundary-scan controller for multi-TAP and concurrent JTAG test and in-system programming. Featuring dual-interface USB and LAN support with four independent Test Access Ports (TAPs), direct serial programming capability and voltage sense support, the NetUSB-1149.1/E fits a multitude of boundary-scan applications. 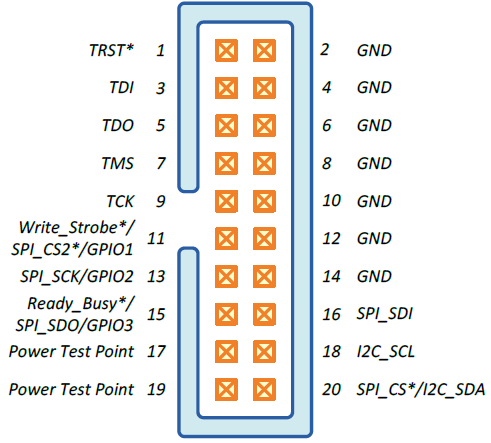 High-performance JTAG controller with I2C and SPI interfaces. Concurrent (gang) testing and In-System Programming (ISP) on up to four UUTs for high volume test. Four TAP connections for UUT designs with multiple scan chains. User programmable JTAG TCK rate up to 70 MHz. Independently configurable output voltage and input voltage threshold. Eight ±50V analog voltage measurement channels; two per TAP. Dual interface with High-speed USB 2.0 and 10/100Base-T Ethernet. Supports Microsoft Windows 7, Windows 8/8.1, Windows 10, and Linux operating systems (32-bit and 64-bit). The Corelis NetUSB-1149.1/E JTAG controller is fully compliant with the IEEE Standard 1149.1 for test access. The standalone unit connects between the host PC through a high-speed USB port or Ethernet connection and up to four TAP connectors on any JTAG-based target system. Support for concurrent (Gang) test execution with in-system programming, voltage sense capabilities, and integrated serial interfaces on each TAP connector make the NetUSB-1149.1/E ideal for multi-TAP, high-volume JTAG and serial bus programming integration. For complete specifications, please refer to the NetUSB-1149.1 User’s Manual. 2-pin (2×10) header (0.100 inches × 0.100 inches). 3M part number 3428-6302 or equivalent. 12-inch cables included. Additional options available. Run concurrent tests and ISP on up to four UUTs with ScanExpress Runner Gang Edition. Save time at test stations with high performance JTAG features—up to 70 MHz on all four TAPs for lightning fast test and in-system-programming. Increase programming rate for in-system-programming; the advanced architecture provides persistent scan vector output and extraction, ensuring that throughput remains high at all times. Reduce costs associated with fixtures; the multi-TAP controller connects to up to four TAPs for multi-TAP and or gang operation. Compatible with the complete ScanExpress™ family of boundary-scan, ISP, and JTAG embedded test products. Corelis offers a complete family of boundary-scan test, JTAG embedded test, and in-system programming tools—all fully compatible and with the NetUSB-1149.1/E advanced features.